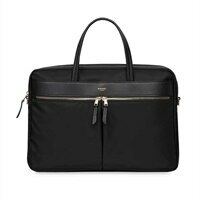 Knomo Hanover Slim Briefcase - Notebook carrying case - 15" - BlackA neat, slim and super-lightweight briefcase with comfortable carry handles and detachable, adjustable shoulder strap. A must-have accessory when you need your laptop and a few essential items. Made from soft and luxurious lightweight nylon with Saffano leather trim. The nylon is spray-coated to offer dirt/water resistance. The internal lining is constructed from soft and colorful grosgrain lining. Bespoke gold-look hardware. A neat, slim and super-lightweight briefcase with comfortable carry handles and detachable, adjustable shoulder strap. A must-have accessory when you need your laptop and a few essential items. Made from soft and luxurious lightweight nylon with Saffano leather trim. The nylon is spray-coated to offer dirt/water resistance. The internal lining is constructed from soft and colorful grosgrain lining. Bespoke gold-look hardware.